This is far from instantaneous music, y'see. The nearly-twelve-minute opener As Syrians Pour in, Lebanon Grapples with Ghosts of a Bloody Past especially will test your patience, building up very slowly until about the fourth minute when a mournful cello begins to wail, other instruments joining it as it forms the nucleus of an orchestral movement. The following Shri Schneider has an electronic patter behind the flittering instruments, a flute discernible behind the almost 80s pop backing before it collapses in on itself, fading to nothing. Glamour Box (Ostinati) marries that electronic patter with the previous orchestral hum, and introduces that well before Son of Man rolls in, my favourite track present mainly due to Rygg's breathy and arresting vocal performance, which is married to some lovely and grandiose orchestration. Noche Oscura del Alma returns to ambience, with some eerie whistles and hums, before Mother of Mercy ends the album with more vocals, almost a continuation of Son of Man initially, returning to the sort of minimalist hum that opened the album. It all very clearly means something (the lengthy title of the opener is seemingly taken from a Reuters article, for example) but it's difficult to know what. 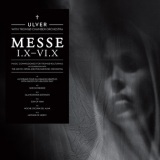 It's not the best thing Ulver have produced of late – I found it hard to follow completely and even slightly dull at moments – but it's undeniably beautiful when it works and more than worth a try. You can hear the full album for free at their BandCamp.